French Maker Of Military Rafts Gets An American Identity : Parallels Zodiac produces most of the inflatable rafts used by the U.S. military. But a California company challenged that contract, saying it violates a requirement that the Defense Department use products made with American material and by U.S. workers. In response, Zodiac set up a factory in Maryland. 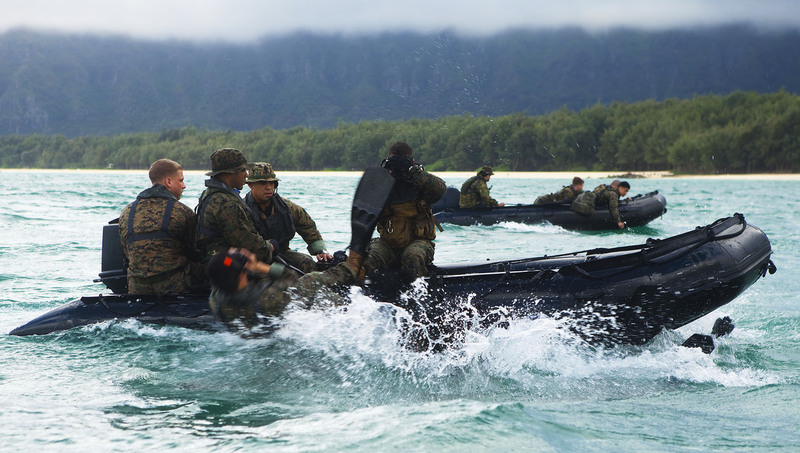 U.S. Marines with 4th Force Reconnaissance Company slide off F470 Combat Rubber Raiding Crafts during training in Waimanalo, Hawaii. The French company Zodiac has been the U.S. military's choice for inflatable rubber rafts for roughly two decades. Now the company is making the rafts in the U.S.
For roughly two decades, the Zodiac has been the U.S. military's choice for inflatable rubber rafts. These rafts, especially the high-end model F470, are not the recreational rafts you take out to the lake on a Sunday, says Lionel Boudeau, the head of Zodiac's North America operations. "It is used for a large variety of missions, like assault landings, infiltration and exfiltration," he says. "It can be deployed from the shore or deployed from the air by an aircraft, a helicopter, by a submarine. It is used by special forces and regular Army." Boudeau says Zodiac supplies the bulk of the U.S. military's inflatable rafts. But that monopoly has made it more difficult for other inflatable raft companies to compete, says Elizabeth Wing, vice president of Wing Inflatables, a California-based company. "Once a contract gets locked in, after it's been awarded, it's a number of years until a contract for the same or similar item comes up again," she says. Wing says her company's inflatables should be given a chance to compete with Zodiac. When a new contract with the Army came up about three years ago, Wing tried to open up the field. She began digging into something called the Berry Amendment, a statute that restricts the Pentagon from purchasing certain supplies that are not made with American materials, such as fibers and textiles, or by American workers. It was a direct challenge to Zodiac, a French company whose boats were made of materials produced overseas. Wing says she believes the Berry Amendment should be applied to the rubber rafts. She says the contracts are worth a lot — $20 million to $30 million each — so she continued to press the Pentagon to re-examine the amendment. She says the Army Materiel Command finally issued a ruling: If the Defense Department wants to buy them, they have to be made in America, with American materials. David Berteau, a senior vice president at the Center for Strategic and International Studies, says he was surprised by the decision. "Ultimately, it's very easy for the bureaucracy to say, 'The easiest thing for me to do is do tomorrow what I was doing yesterday,' " he says. "And in this case, it took the vendor to come in and say, 'You guys need to pay attention and ask these questions over again, and come up with new answers.' "
The Pentagon's decision had a huge impact on Zodiac. The company quickly transformed a sales office in Stevensville, Md., into a factory. Its experts came in from all over the world to train newly hired local staff. Boudeau says the boats are now compliant with the Berry Amendment. "These boats are built by U.S. citizens, using U.S.-sourced textile material," he says. "Fabric, webbing, ropes — everything comes from the U.S. and is very compliant." Boudeau says it was a challenge to quickly ramp up production in the U.S., but it was worth it for financial reasons and to maintain a long history with the U.S. military. He says that relationship helps Zodiac sell products worldwide. Wing, of Wing Inflatables, says the playing field is now level. "For us, that was really the name of the game — to ensure that our competitor didn't have an unfair advantage," she says. There are two contracts — for the Army and the Navy — coming up. Wing, Zodiac and several other inflatable boat companies are vying for those contracts.